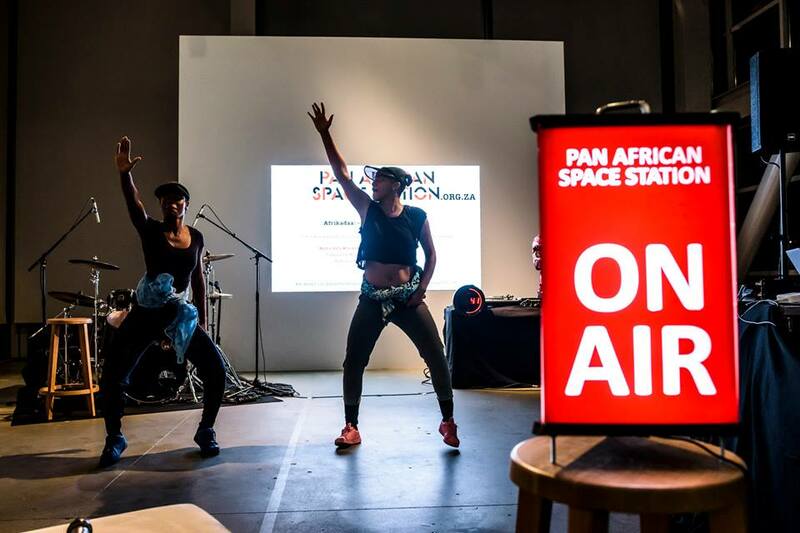 From 17 – 19 September 2015 , the Pan African Space Station (PASS) installed our pop-up inside the gallery of Fondation Cartier, Paris with live programming that explored the past-present-future of Congolese music cultures. This intervention featured as part of the exhibition Beauté Congo – 1926-2015 – Congo Kitoko. Contributions by Bintou Simporé (Nova), Ray Lema, Afrikadaa Magazine, Helmie Bellini trio (feat. Hilaire Penda), Andy Amadi Okoroafor (Clam Mag), DJ Mo Laudi, Dinozord and David Bovée of Schengen Shegue, Pitcho, Jolie Ngemi, Boddhi Satva and more artists in studio. Duetting in their unique ways, Baloji teamed up with legendary guitar player Dizzy Mandjeku for a performance-lecture, the Kongo Astronauts with Méga Mingiedi, Christine Eyene extended encounters to examine bikutsi music with filmmaker Blaise Ndjehoya, and talks on Congolese cinema by Jean-Pierre Bekelo and Mweze Ngangura. Additionally, Binetou Sylla of Syllart Records provided a regular feature facilitating conversations with and performances by Alain Mabanckou, Nyboma, Fabregas Métis Noir, Dally Kimoko, Lokassa Ya Mbongo, Yondo Sister, Kékélé and Bumba Massa. Contributions beamed in from New York, Montreal and Kinshasa to present the writers collective Moziki littéraire, from the Centre d’Art Picha in Lubumbashi, and from Bogota by Afro-Columbian music pioneers Palenque Records. To listen to recordings from PASS Paris, visit our Mixcloud. Category: News, Pass Blog, Pass Pop-up | Tags: PASS Paris, PASS Pop-up | Bookmark: permalink.